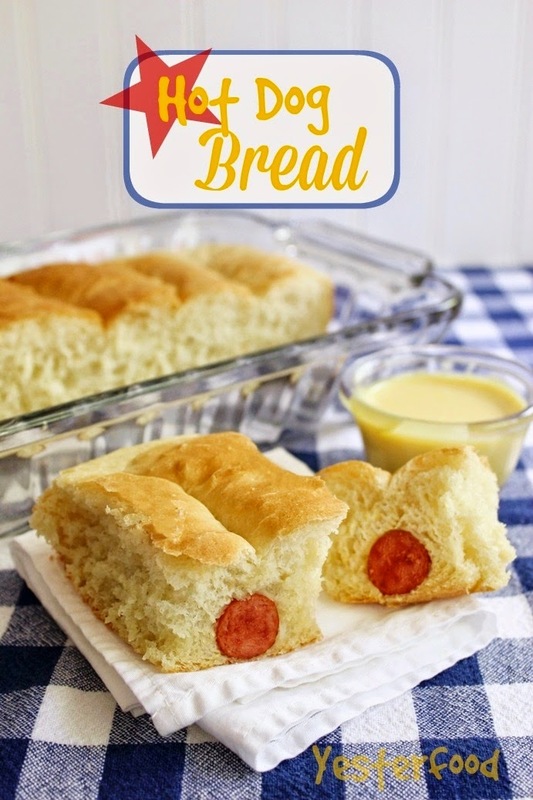 Hot Dog Bread is brought to you by Red Star Yeast, and I am happy to give you my honest opinion about it. This is fun food. 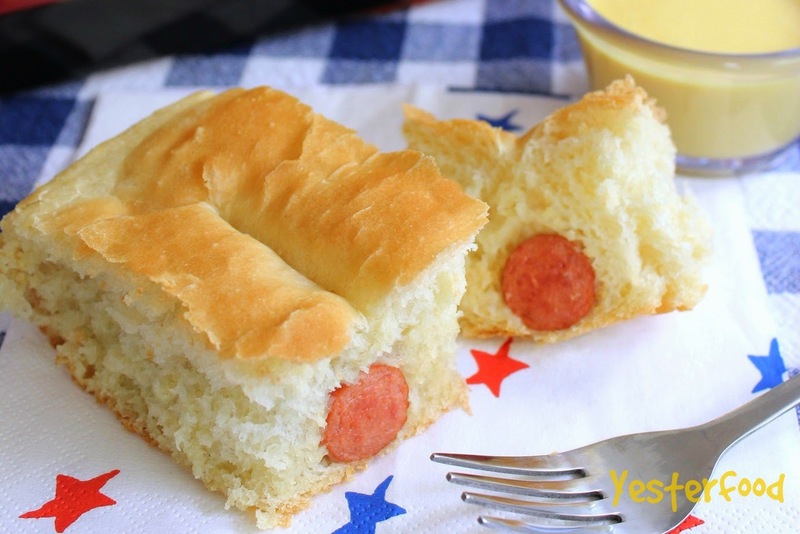 It bakes like an easy casserole, but eats like a hot dog. 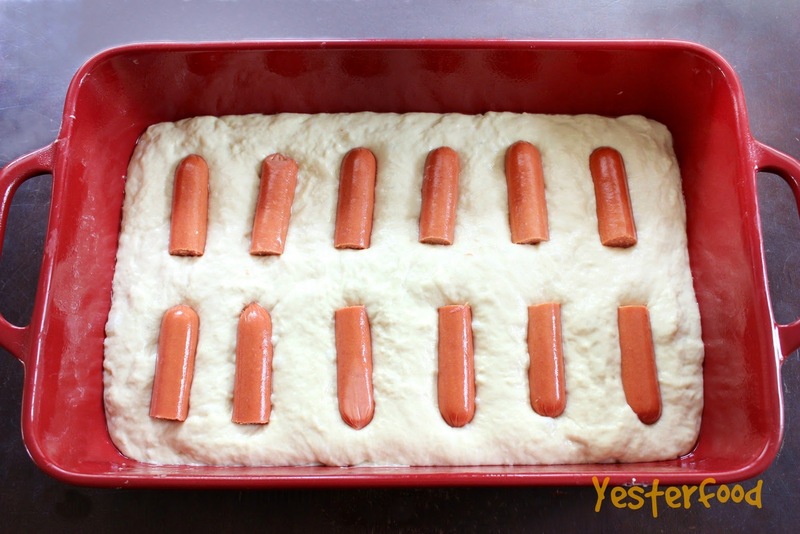 The flavorful yeast bread dough is slightly sweet and chewy, and bakes up and around the hot dogs. 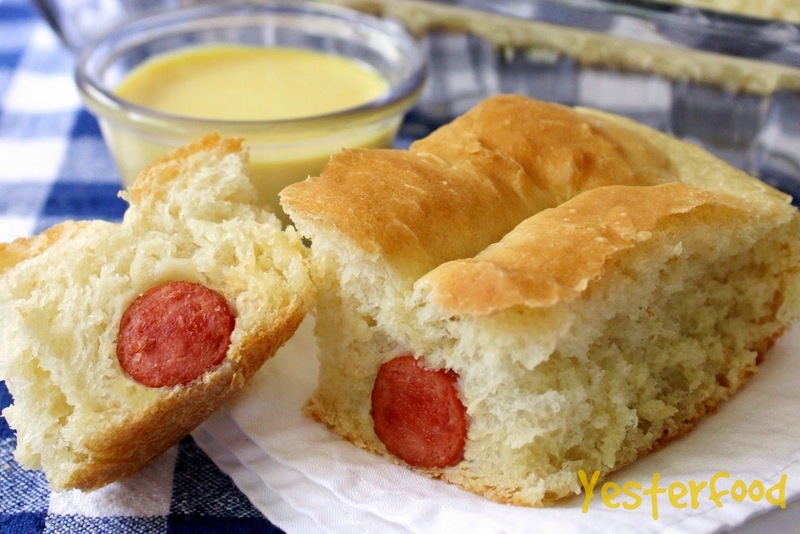 You get the delicious taste of homemade hot dog buns without as much fuss. I knew the kids at our get-together would love it, but the grownups did, too. There weren't any leftovers. Let it rise a second time, then bake for about half an hour and enjoy. Get the full recipe and instructions at Red Star Yeast here. Pass small bowls of your favorite dipping sauces and let the fun begin! In a small bowl, whisk all ingredients together. Refrigerate leftovers, tightly covered. In a small sauce pan, whisk cornstarch into chicken both until combined. Over medium-low heat, stir in the rest of the ingredients and bring to a simmer. Cook, stirring frequently, until thickened, about 5 minutes. Refrigerate leftovers, tightly covered. Browse their huge collection of recipes. 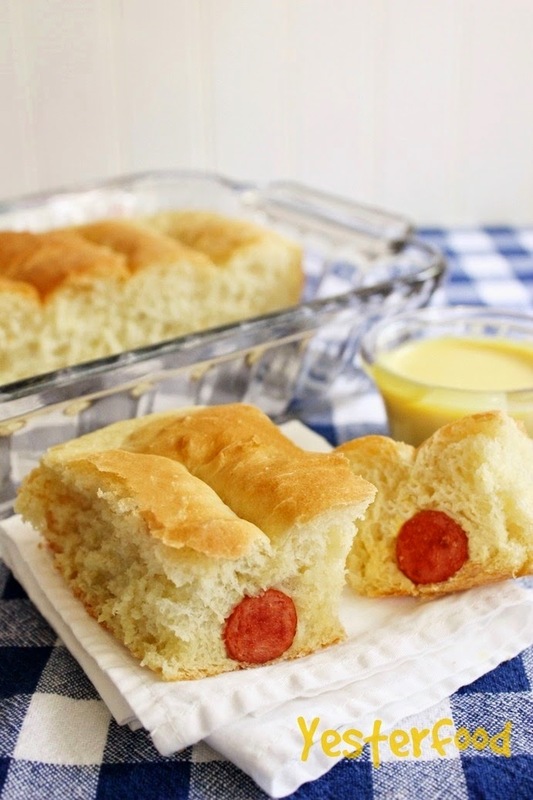 Hot Dog Bread may have been taken to some of these fun parties! Dee, we LOVED it. My daughter was talking about it again today, and I made it 2 weeks ago! :) Hope you have a good week! What a neat idea - my kids will love this!! This would be great at a get together for sure! So smart! My son will love this. Joy, I just love this! Great recipe and I know it would be family favorite! Thanks for sharing at the In and Out of the Kitchen Link Party! My weakness is homemade bread. This reminds me of a pigs n the blanket but with a whole lot more bread, which is the best part. Great idea! This idea is so unique! My biggest pet peeve when eating a hot dog is either the bun from falls apart or the hot dog wont stay put. This solves both problems and I am sure the homemade bread is 100 times better than a dry old hot dog bun. Love, love, love this creative idea! What a fun recipe! My nephews will be visiting, and I know they'll love this recipe! Thank you! Genius….I love this! I can't wait to make these for the grandchildren! G'day! So reminds me of childhood yum Joy! This is such a fun idea! My kiddos will love it! Thanks! What a fun and lighter way to have something like a corndog!! Pinning! I was searching for your post on Connie's party and "just knew" this was it before I clicked! What a cute, cute idea....the kids will go nuts over it! Thank you! This looks good, I really want to try that sweet and spicy sauce. It sounds wonderful. Oh what a fun recipe! I'll bet the kids would love it. Thank you for sharing at What We Accomplished Wednesdays. Have a great weekend! I am seriously drooling here! Thanks for coming and linking up at The Weekend Social. Please be sure to come back next week starting Thursdays at 9PM EST on culinaryflavors.gr ! I hope to see you there! Definitely fun food. I like the idea of serving with dipping sauces. I'll have to make this for my son! Thanks for linking up, Joy! Delicious Joy, Love the bread and dipping sauce. I will give it try. Thanks for sharing with Hearth and Soul blog hop. This is kind of fun Joy. Love the idea of the dipping sauce. Gotta give it a try! Thanks for sharing with SYC. Yum! I should make these for the family, they'd love them! Thanks for sharing on Worthwhile Wednesdays! These are adorable Joy!! I am loosing my mind, I could have sworn that it said hippie sauces. ;) Whatever it says, I can't wait to try them!! Hmmm, I’m not really sure, but if I were to try something, I might try frozen bread dough- thaw it and then go from there! Let us know if you try it! :) Thanks for coming by! PS Gotta try this for the grandbabies!! G'day lovely lady! That looks delicious. I've just pinned your post and it is also on my Pinterest Page on Facebook. Thanks for sharing at the Say G'day Saturday Linky Party! How about this: Bake this as bread loaf in the bread machine. Slice or dice wieners up and add to flour mixture. Brush loaf with drippings. It was very tasty. Thank you for your recipe.